Drum circles are everywhere. People clearly enjoy them even without formal training in drumming. After awhile, though, they all started to sound the same to me. I never wanted to study African drumming. I knew certain rhythms were used to call the orishas or other spirits, and as a student of metaphysics, I didn’t want to study with a teacher who didn’t understand the effects of the rhythms. In drum jams with friends, while some played djembes or ashikos, I would accent the rhythm with iron bells or claves (hardwood sticks). Sometimes I would accent the rhythm by playing a large hoop drum, using a padded stick. It seemed safe enough since we weren’t playing “real” rhythms. 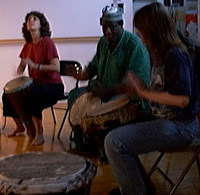 Then a friend told me about her fabulous African drum teacher, Abubakr Kouyate, a master drummer and a very spiritual person, who taught the purposes of the rhythms as well as how to play them. The class was fun and uplifting, she said—and right in my neighborhood.